A ribbon cutting was held to celebrate the Grand Opening of the NewMeadow Preschool located on 23 Sitterly Rd in Halfmoon. On hand to celebrate the occasion was family, friends and staff. In addition, students and their families joined in too. A dedication to honor their lifetime of devotion in service to children with special needs and their families, a tree was planted in the name of Thomas and Donna Funiciello. 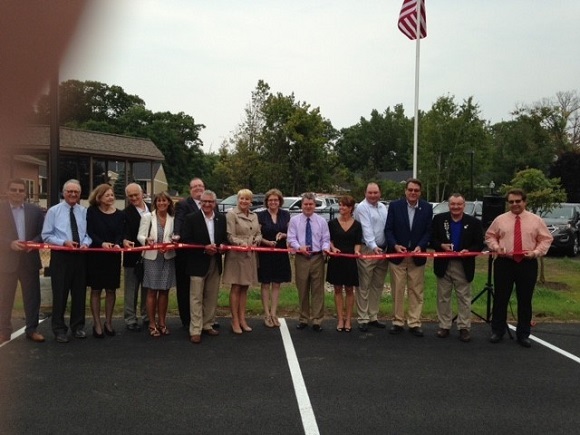 Pictured is Founders Dr. Thomas and Donna Funiciello along with Senator James Tedisco, Assemblywoman Mary Beth Walsh, Halfmoon Town Supervisor Kevin Tollisen, Halfmoon Town Councilwoman Daphne Jordan, Malta Town Supervisor Vincent DeLucia, The Chamber of Southern Saratoga County President/CEO Pete Bardunias. The ribbon is flanked by Chamber Ambassadors Randy Hagen from Ballston Spa National Bank and Louis Dahoda from Edward Jones.